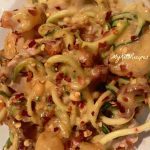 Sun dried tomato zoodles with sun dried tomato, garlic, and parmesan sauce is so delicious! Can you believe it’s low carb?! Such yummy goodness. This is a delicious low carb dish! The cream based sauce is so easy to make! It will only take you minutes to make and it’s so worth it. With minimal ingredients you can make this easy meal on a weeknight with no problem. It tastes wonderful and even my kids loved it. Have you ever made zoodles before? They are like noodles but made with zucchini and the benefit is they are more healthy because they are low in carbs. Real pasta noodles like spaghetti noodles are high in carbohydrates and not good for your waistline or your health. Before I started a Ketogenic diet I hadn’t ever eaten zoodles. I went out and bought a spiralizer (AKA: spiral slicer) for about $20 and it does the trick. You don’t need anything fancy. You take the zucchini and make spiral noodles out of it and they are just like the real pasta once you mix them with sauce. 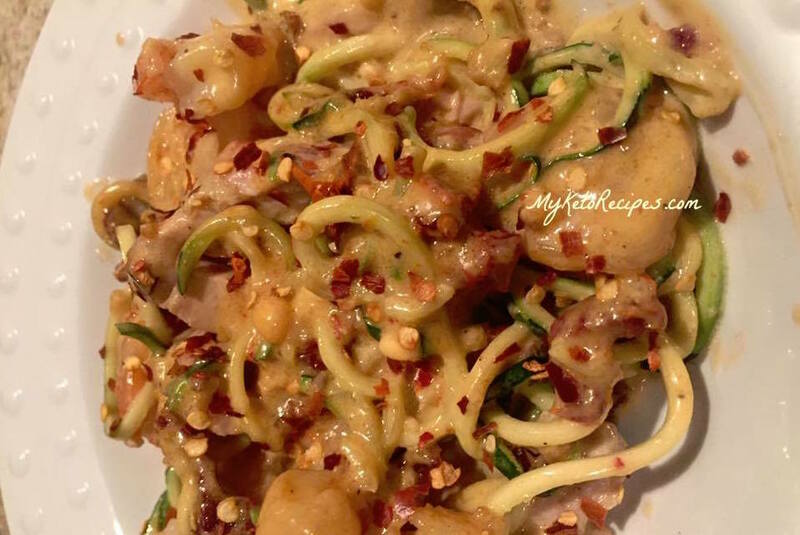 You can replace high carb pasta noodles with zoodles in any dish. When we make spaghetti for the kids I do zucchini spirals for hubby and I. My spiralizer came with 3 blades so you can actually spiral all kids of veggies. Cucumbers are another veggie I spiral often. If you don’t have a spiralizer you can grate the zucchini for the recipe. Since I started drinking Keto/os I love how making low carb, ketogenic meals has become so much fun and staying healthy is amazing easy! Even the kids are loving the Keto lifestyle, and my daughter, who is 13, just recently started drinking Keto/os everyday. She loves eating low carb and finds a difference in her athletic performance thanks to these positive changes. Last evening she had an endurance test and performed at the excellence level. She said the difference between this test and the one before was the fact that this time she drank a Keto/os beforehand and she felt it gave her more energy and the ability to go longer without getting tired. It’s amazing what this drink is doing for people young and old! Next articleLow Carb vs Keto Diet: What’s the Difference?